48 sheets of paper and cardstock. 7.5 x 9 in co-ordinating shades of burgundy/pink. 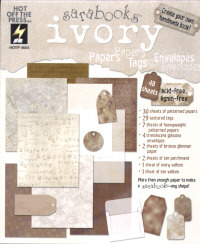 30 sheets of patterned papers 29 textured tags 7 sheets of heavyweight patterned papers 4 translucent glassine envelopes 2 sheets of bronze glimmer paper 2 sheets of tan parchment 1 sheet of ivory vellum and 1 sheet of tan vellum.